The Board of Directors hereby gives notice that the annual general meeting of the Narragansett Historical Society will take place on Sunday, April 15, 2018, at 2:00 pm at The Towers, 35 Ocean Road, Narragansett, RI. The transaction of such other business as may properly come before the meeting. 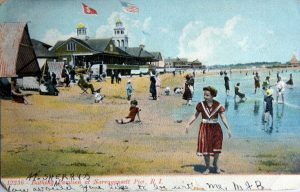 Professor Klein has a long history with Narragansett, having lived on both Ocean Road and Central Street, written the foreword for published books about Narragansett history. We are delighted that he is able to join us and share his knowledge with us. The event is free and open to the public – however, only members in good standing may vote.